This is the 2dn version of the XML AS3.0 Flash Twist Template Deep Linking with complex Flash effects and a great usability feature of fast loading photos of any size. This version additionally contains a Shopping Cart and has already implemented PayPal payment option. This Flash template it's resizable adjusting after the browser size. Everything will look the same on each resolution and your photos will appear the same for all your visitors. This Flash template use deep linking. You will have a unique link for all the template sections generated dynamically based on the section name (e.g. you have the possibility to send to a client the link for a specific image). This feature also enables the "back one page" and "forward one page" browser buttons. This version allows you to sell your images using a Cart and then PayPal. You can add as many galleries and custom text windows as you would like. Advanced video player with playlist and categories. You can add as many video categories as you might need. This Flash template uses advanced text windows (e.g. "About us"). You can add any text, format it with HTML, so you can add images or SWF files, change the color, size of the text, add external links etc. You can add as many similar windows as you need. A detailed contact window with a contact form. External links menu buttons can be added. MP3 sound playing in the background. * Full screen video mode supported. * You can add as many Custom text window as you need. * You can set the width for the custom text windows, the height will automatically adjust based on how much content there is to display. * An advanced scrollbar will appear if the content will not fit into the browser. 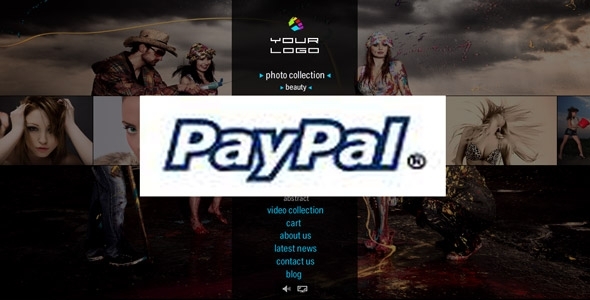 * You can sell your images using the cart implemented into this template via PayPal. * The currency code can be set to any type that you need. * You can specify the PayPal account email, the PayPal account into which the payment will be made. * You can add your one email address into which the message will be sent. I like your template and I would like to use it for a site that has to be in both versions English and Italian. Off course I would have to create 2 different XML files. Would be possible to introduce a language selector for Italian and English pointing to the respective XML file? If possible how much would that be?